This particular bento box was one of those accidental discoveries. Browsing through one of those 88 peso displays in the local supermarket, this was labeled as a party tray. Something you can use for an assortment of hors d’ oeuvres. Of course, my bento-obsessed eyes saw differently and saw it as a partitioned bento box. And it works! See here, how I’ve packed rice with an umeboshi (Japanese pickled plum), strips of beef stir-fried in soy sauce and butter, slices of peeled kiwi fruit and tomato slices. While I usually don’t mind the flavors of my main viand and rice mixing, when it comes to fruit, I do mind. The partitions work perfectly in keeping the flavors—fruit and buttery soy sauce—apart. Of course, it’s far from perfect. If you tip it to the side, the sauces will spill over. And the top isn’t as airtight as I’d like, so I use it with one of my flat carrying cases to make sure that the cover stays as tight as it can. Hey, for something that costs less than 2 USD, you won’t really hear me complaining. Plus, if I decide to throw a party, I have a handy dandy party tray ready. How’s that for multi-tasking? So, lesson for the day? Keep your eyes peeled and your wallets ready to snag bento bargains when they come. nice! since it’s 2 things in one, it’s only P44.00. a bargain indeed. hehe! 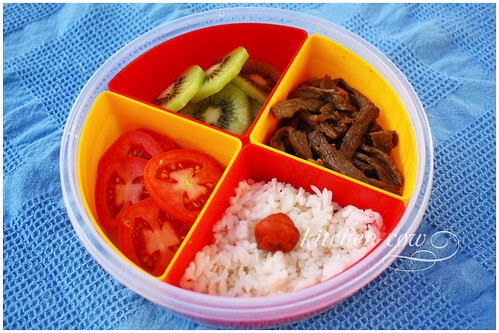 I have been mooning over your bento box collection since I first came upon your blog. I would like to start my own, but what would you recommend? And where do you find the tiny squeeze bottles? I have posted in sevreal bento forums some of the things I’ve found in bargain bins, and recyclables that work really well. So far, my best ideas are the round holders that cheap prize machines give out, they are leakproof and a nice size for a onigiri-form, they now have tiny ones too with rings inside, that could easily hold salt and peppper mix or furikake. Also, the dropley shaped bottle of foodcoloring, when empty make adorable sauce containers, just like the soy fishies! My newest is the ice cube tray mini onigiri, you just slip a small square of egg or spam in the bottom, pack on the rice and pop them out! Hey, thanks for the ideas. They sound great, I especially like the idea of using an ice cube tray for mini-onigiri. Tiny spam musubi!